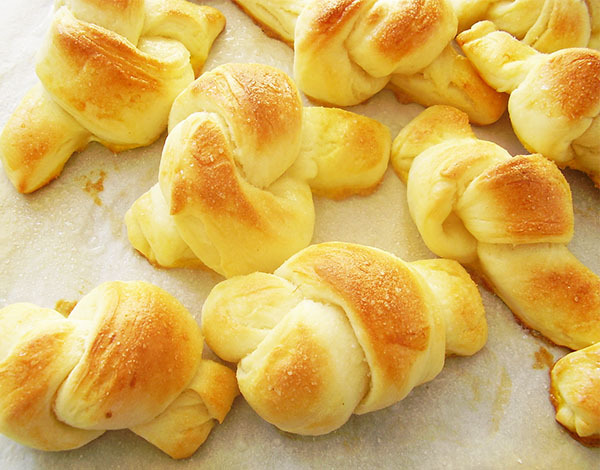 Amish White Bread Garlic Knots: Award winning! Yes, I am serious about becoming popular with this appetizer. Since I cook almost every day, I have noticed that the flour quantity is not always the same: sometimes the flour is dryer than usual. This leads me to the conclusion that wheat humidity depends on the season, and how much rain there was where it was growing. 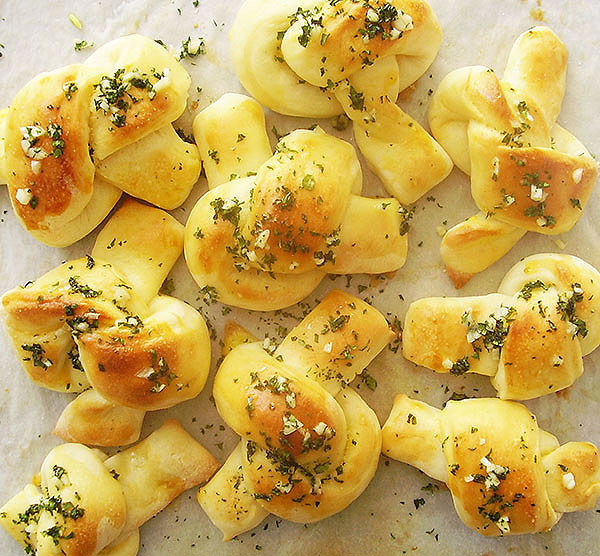 When making garlic knots this time, the flour was “thirstier” than usual. The only thing I have changed in the Amish White Bread is the amount of sugar. I use less, otherwise it would be too sweet to go with the garlic spread. The rest works perfectly. In a bowl, mix all the dough ingredients and leave to rest for 30 minutes. Prepare two sheet cake pans and cover them with baking paper, oiled on the upper side. Mix the egg yolk and water for the egg wash.
Preheat the oven to 356° F / 180° C.
Take one half of the dough out and knead for a few minutes. 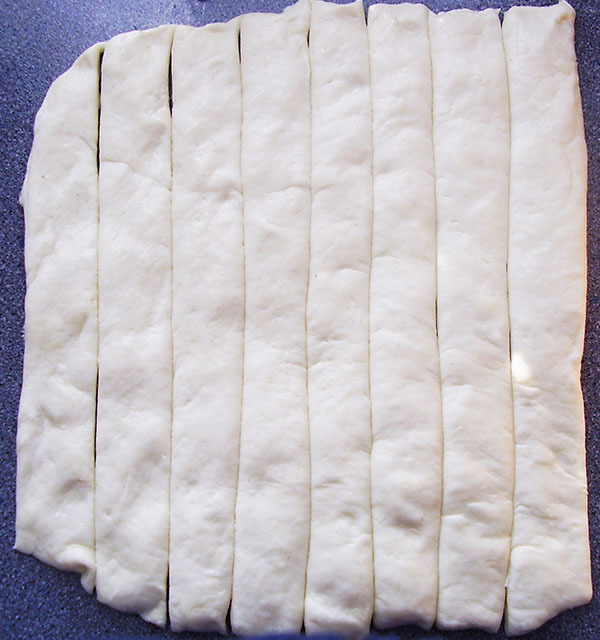 Roll the dough on an oiled surface to form a rectangular shape of 10 x 11 inches. Using a sharp knife, cut it into ribbons, 1 inch wide. Twist and tie each ribbon to have a knot. 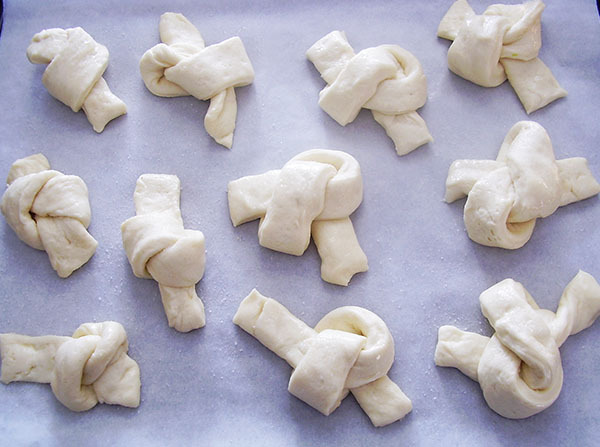 Place the knots onto the oiled baking paper and egg wash them. 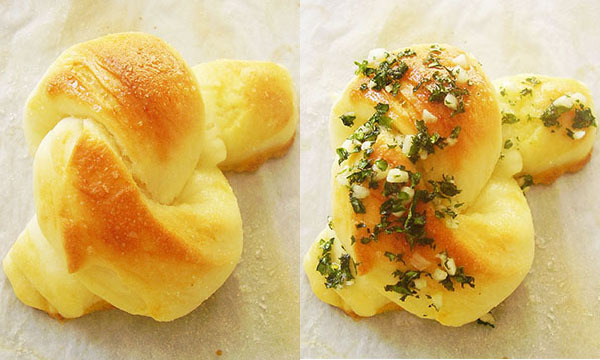 Bake for 15 – 16 minutes. Repeat steps 5 to 10 with the rest of the dough. When the second batch is baking, mix the ingredients for the garlic spread. While the knots are still warm, brush the spread over them and serve. 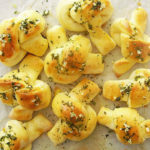 6 Responses to "Amish White Bread Garlic Knots"
Welcome to 2pots2cook Bev ! Glad you love the Knots 🙂 Thank you for commenting ! The warm water is not very well written is it tbsp. or cups??? Do you mean the first quantity is tablespoons and the second cups?? ?